Dating to the ninth century B.C., Homer’s timeless poem still vividly conveys the horror and heroism of men and gods wrestling with towering emotions and battling amidst devastation and destruction, as it moves inexorably to the wrenching, tragic conclusion of the Trojan War. Renowned classicist Bernard Knox observes in his superb introduction that although the violence of the Iliad is grim and relentless, it coexists with both images of civilized life and a poignant yearning for peace. This Penguin Classics Deluxe edition also features French flaps and deckle-edged paper. Homer was probably born around 725BC on the Coast of Asia Minor, now the coast of Turkey, but then really a part of Greece. Homer was the first Greek writer whose work survives. He was one of a long line of bards, or poets, who worked in the oral tradition. Homer and other bards of the time could recite, or chant, long epic poems. 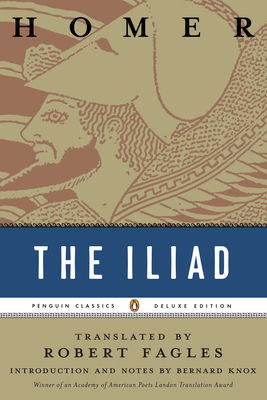 Both works attributed to Homer – the Iliad and the Odyssey – are over ten thousand lines long in the original. Homer must have had an amazing memory but was helped by the formulaic poetry style of the time. Robert Fagles (1933-2008) was Arthur W. Marks ’19 Professor of Comparative Literature, Emeritus, at Princeton University. He was the recipient of the 1997 PEN/Ralph Manheim Medal for Translation and a 1996 Award in Literature from the American Academy of Arts and Letters. His translations include Sophocles’s Three Theban Plays, Aeschylus’s Oresteia (nominated for a National Book Award), Homer’s Iliad (winner of the 1991 Harold Morton Landon Translation Award by The Academy of American Poets), Homer’s Odyssey, and Virgil's Aeneid. Bernard Knox (1914-2010) was Director Emeritus of Harvard’s Center for Hellenic Studies in Washington, D.C. He taught at Yale University for many years. Among his numerous honors are awards from the National Institute of Arts and Letters and the National Endowment for the Humanities. His works include The Heroic Temper: Studies in Sophoclean Tragedy, Oedipus at Thebes: Sophocles’ Tragic Hero and His Time and Essays Ancient and Modern (awarded the 1989 PEN/Spielvogel-Diamonstein Award).